I've come a long way from when Cameron Macintosh got me a cake on my 20th birthday that said, 'Now your teens have passed their test, so give your virgin act a rest.'" US ASIANS: What prompted your trust in Christine Yasunaga (Flower Drum Song fellow cast member) to the good fortune being introduced in November 2001 of meeting your future husband - her favorite cousin – and a session of singing along to the music from a car’s radio to receiving a 1.5 carat engagement ring? LEA SALONGA: As I got to know Christine, I got to trust her (that's usually how it's built, but getting to know someone over time). The more she got to know me, the more she figured that Rob and I might be a good pair to set up on a date. I was glad that she did; in November 2002, we went on our first night out, and have been together ever since. We both love to eat, sing, and laugh together. The engagement ring was just a natural progression of a wonderful relationship. LEA SALONGA: I just experience freedom. It's kind of ironic to describe marriage as a state of incredible freedom, but it is. Just not having to be bound to being on your best behavior or having to always try and make a good impression or not being happy in a relationship is definitely liberating, and when you're free to just be yourself with the person you love, it affects every other part of your life. US ASIANS: Recognizing the great diversity that exists within your marriage (Robert: Chinese/Japanese/Hawaiian/American & Lea: Filipino/American), how will diversity be handled when you have your 2 to 3 kids? LEA SALONGA: We'll figure it out if and when it happens. For sure we'll definitely tell our kids about their roots, but they'll be raised American. This country is a melting pot of cultures and people, just like them. US ASIANS: Applauding your goals to have your children bi-lingual (Tagalog, British – cockney and fine British - and English), would they also be learning Chinese and Japanese, along with various aspects of being born in Hawaii – as the result of Robert’s ethnic background and heritage (especially since Robert looks like a Pinoy?!?!)? LEA SALONGA: Okay... the British thing above are ACCENTS, not LANGUAGES. They'll be bilingual in Tagalog and English. Unfortunately they won't be learning Chinese or Japanese, as Rob speaks neither language. I probably will ask Rob's Chinese grandmother to expose my children's ears to Chinese. It's something I'd like for them to hear and learn. US ASIANS: Reflecting on your comment that "My family is far more important than my work, and that's how I feel things should be" – will there be a time where you’ll be limiting your appearances because of family or children – especially since it’s been rumored that you are planning to resume her pre-med studies? Mrs. Salonga (Lea's mother) said Lea is now on her seventh week and if our calculation is right, her due date will fall in May, 2006. Mrs. Salonga told us that the husband and wife are very excited and ecstatic over the development. Lea and Rob have been waiting patiently for this "gift" at the onset of this year. Knowing that everything happens in God's perfect timing, they just waited and cherished every moment of their togetherness since they tied the knot in January of 2004. LEA SALONGA: Oh goodness, where did you hear that I would be resuming pre-med? I'll be limiting my appearances when a child comes into the picture. At that point, all energies must be focused on raising children, with all else becoming 2nd priority. That is how I was brought up, and chances are that's how my own children will be brought up too. US ASIANS: Recognizing that you own a 2002 white Lexus IS300 E-Shift Sedan with ivory interior, is there a “his and hers” Lexus IS300? LEA SALONGA: No, my husband drives a Mini Cooper S.
LEA SALONGA: No, it doesn't. In fact, he's probably more worldly than I am. This Cebu-born Filipina designed the radiant gown (in addition to a second gown to wear at the reception, as well as her mom's, the groom's mother, the groom's stepmother and the five bridesmaids dresses) that Britney Spears wore when she married her boyfriend Kevin Federline - along with the wedding gown of Lea Salonga. She belongs to the well-heeled Lhuillier clan who own numerous jewelry stores in Manila. She has been featured on various fashion magazines like People, US Weekly, In Style, Vogue, Vanity Fair and others. Her client list includes celebrities such as Mariah Carey, Sarah Jessica Parker, Angelina Jolie, Janet Jackson, Paris Hilton and Tatum O’Neal. Monique Lhuillier is considered one of the leading innovative fashion houses in terms of design, quality and brand image. For additional info, click HERE. US ASIANS: Recognizing your description of Robert of being "the amalgamation of everything I loved in my previous boyfriends” that included a great sense of humor, great-looking, a family-oriented Christian with whom I am very comfortable praying with, God-fearing, very “maasikaso,” extremely affectionate, demonstrative of his feelings and the only one who really considered my mom foremost – are there additional qualities that you’ve discovered and/or you’ve discovered or surprised by the greater depth in the qualities that he possess? LEA SALONGA: Hmmm... as time goes on, I just realize how much he puts our marriage on the front burner of his life. All decisions he makes are with the both of us in mind... we both think in that way. I've also discovered his patience... it runs far far deeper than my own. He's also someone who's willing to put his pride aside if he's wrong, and will not let an argument go very far. US ASIANS: Since Robert is involved with a technology-based company (Note: He specializes in customer relations management technology), will there be more information on your many activities on the Internet? LEA SALONGA: He's a tech businessman, not a webmaster. So, no. I'll ultimately decide of I'll have more of a presence on the internet. US ASIANS: Asked during an exclusive interview in L.A. last year why Rob chose July 28 to make his marriage proposal, Lea said, "In Chinese, 8 is supposed to be a lucky number, isn’t it?" LEA SALONGA: Yep, that's right. US ASIANS: Recognizing your mother’s advice on dating that "The man you should marry should love you more than you love him" and discovering that this person is Robert – what surprise benefits has this brought you? LEA SALONGA: I don't know that it's provided "surprise benefits" necessarily... it just manifests itself in our day-to-day relationship. I know – and always will know – that my best interests and the interests of our marriage will always be on his mind. I guess she just wanted to make sure that I would always be taken care of in the way that she felt I deserved... and my husband treats me like a queen. No complaints. US ASIANS: Did the absence of Rob’s mother (acknowledging that her passing, as the result of an aneurysm in the brain, wasn’t able to attend their wedding) provide additional motivation to carry passion in every aspect of your lives together? LEA SALONGA: It does tell us to live our lives fully in the way that she did. She lived a very full and vibrant life. 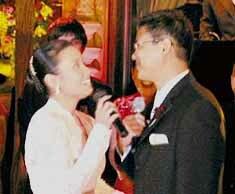 US ASIANS: Could you share which one of your (Robert and yourself) songs – that included a special duet and a song written especially for the wedding - that were included in your custom-made CD that was given to each wedding guest. LEA SALONGA: Rob and I only recorded one duet for the album (With You I'm Born Again), plus one solo (Two Words). The rest were songs that we both just liked. US ASIANS: How did the process of filming your wedding ("I Do" — The Robert Chien-Lea Salonga Wedding Special aired on ABS-CBN Channel 2 on Jan. 23, Friday, 9 p.m. with Bobby Garcia as director, Chit Guerrero as supervising producer, Mickey Munoz as program manager, Esterbelle Francisco and Jinky Fabelico as executive producers, and Mori Rodriguez as writer – along with footage from your bridal shower, Robert’s Las Vegas stag party, interviews with family members and Robert’s proposal) add to the magic and intimacy of your wedding? LEA SALONGA: I don't know how having a camera crew and a huge production staff added to the intimacy of the wedding, because there's nothing intimate about having your wedding aired on national TV. It did enable us to share the day with my fans... many of them wanted to somehow be part of the day. US ASIANS: Could you elaborate the importance of having everyone involved in the wedding as part of your “life security force? LEA SALONGA: In what interview did I mention this? I can't remember the reference. Unless you mean this: everyone who was involved in my wedding was a large part of my life. My best friend was the coordinator and Best Man, my best girlfriends were the Matron of Honor and Bridesmaids (some of whom even sang or played music at the wedding). Those who were actively involved in the planning of the day were people close to me. It made the wedding day very personal. US ASIANS: What are your lasting memories, impressions and words on July 28 of the following? The tuxedo itself wasn't surrounded by flowers... the rose petals were on the ground, and the long stem roses and baby's breath were in a vase. The rabbit was in a separate location. My husband just wanted something cute. The only song that had anything to do with the engagement was A Whole New World. Two of our friends sang it for us from Rob's bedroom balcony, above where we were. The other songs were sung only on the wedding day.